Thank you Najwa for your beautiful poem. Taking your colorful wings” – my favorite lines in this poem. But as you say, spring will come and your wings will return. Thank you for the poem. This is a beautifully written poem. The image of spring soaring swiftly nearer is perfect. A poignant piece of writing. What a lovely poem. It uses so much metaphor to describe yourself like an innocent bird. I can sense how you feel by telling the bird- your scared, worried, and alone. Yet unlike the bird, who could fly away, you can’t, instead you must stay and face your these dangers. May fate decide a bright path for you. 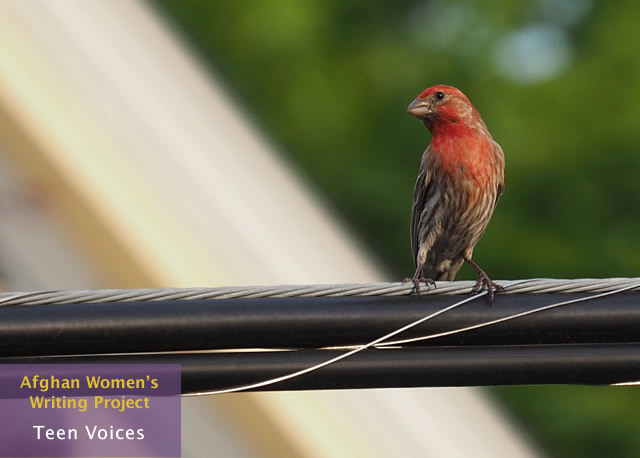 This poem relates the struggle of Afghani women to a bird. The author of this poem uses this metaphor of comparing oneself to a bird to relate many things that goes on in her life. One example is when she compares the city that she lives in as a nest. She however, says that the city is no longer her nest. A nest is a homely thing that gives birds protection and safety, however, when she says it is no longer her nest it shows that the city that she lives in no longer provides her safety and protection. She uses her comparison to a bird to show the struggles of Afghani women in a patriarchal society. I think that this poem is beautifully written. The comparison between the author and the bird allows the reader to connect more strongly with the author. Figurative language such as the personification of time and relating falling rain to tears add to the imagery in this poem. The changing of seasons also shows how difficult times can eventually improve. However, although the bird is said to fly away from its cruel home in spring, the author cannot escape. She is forever trapped in a place she can no longer call home. As Pakiza wrote, every season seems like fall, where everything is dark and gloomy. This is a beautiful poem with its representation of the society and culture of many middle eastern countries of today and in the past. The bird represent women in the culture in the sense that they are beautiful, yet extremely underappreciated. The poem seems to explain a bird stuck in harsh conditions and a lack of support and love. This shows how women are trapped in a world where they are expected to work without appreciation, remain loyal to those who they may or may not love, and support a cause in which they may or may not support. This unfortunately is the society in which they are expected to live. Several commenters here acknowledge the author’s comparison of her struggles to the bird, but then they say that the bird can fly away while the author can’t escape. The comparison does not end with winter. Spring is also a metaphor, for better conditions, good things in life. In telling the bird that spring will come and it can fly, Najwa is telling herself (and all who struggle) that metaphorical spring is also inevitable and she too will have her opportunity to be uplifted and experience the good beyond these current hardships (winter). This is my favorite part of the poem – more than giving hope, it promises better times to come. The world is not just cruel, it is also beautiful thanks to feeling loving people like you who can create such beautiful poem. This is beautiful!! You shouldn’t have to carry this burden so young, I’m behind you all the way love. Keep writing. “Spring soars swiftly to you.” My favorite line. May Spring soar swiftly to you as well. This poem is so beautiful and it makes me feel like happiness and as if there is hope. You have so much talent to be so young. I hope you continue to write. This poem is beautiful and so full of hope. Thank you for your courage to share it with the world. Dear Najwa, this poem is beautifully written and so full of emotion. Thank you for sharing it and stay strong. Dear Najwa, this poem is beautifully written and I pray that you will not have to wait much longer to find the peace and happiness that you deserve. Thank you for sharing your poem and stay strong. Thank you for sharing your poem, it takes a lot of courage. I hope you continue writing and I’m looking forward to it! Winter always ends. Spring will come. I love that your poem was written to a bird. There is a lot of symbolism packed into there, and I felt very moved by it. The different aspects of symbolism and figurative language made this poem especially stand out with a more profound meaning as you read. The impact of comparing your emotions to the seasons is also incredibly powerful and beautiful. It expresses the deep sorrow that lies in the injustice of your society. You, as a young girl, possess a powerful voice which can be used to change the world. I admire you for using this voice to express your sorrows, for putting yourself in a vulnerable place to bring light the feelings you are experiencing. To do what you have done takes courage, which is what many other women in your position need. Your poem has many deep societal and cultural implications that speak worlds about the lives of girls in your place. Your voice works to inspire other young girls to be brave and to speak their voices to be able to express their opinions and feelings. Your writing is beautiful and has the power to impact people. Spring will come soon for you. Your poem summarizes the issues in society regarding women and your feelings towards them. By using the bird as way to represent women, you introduce a sense of innocence because birds are usually calm and innocent animals. Using the nest as home, you describe the cruelty and damage in society have ruined the lives for the birds. After stating all the negative aspects, you described your optimism in an inspiring way that was not too aggressive but perfect to state your attitude towards the issue. What I enjoyed the most is how true the poem is to the issue and how it describes how it should be solved. Good job and keep it up ! This poem is truly stunning, you have mastered drawing beauty from the simplicity of your metaphors. You manage to somehow say the simplest sentences like “Our nest is no longer home” but fill them with all the melancholy that comes with being a victim of war. Your use of the symbolism of nature gives this poem so many interpretations and levels, making it a unique experience for each individual reader. I hope you understand how powerful your words are, in a span of 1 line you’ve managed to completely change my emotions and take me with you on your experiences. Although I can’t imagine what you’ve been through I still found myself feeling the fear, hurt and hope that the “bird” feels. I know that it’s not possible for you to “spread your wings” and fly away from your problems as easily as the bird. You are forced to confront your fears everyday and for that, I admire you all the more. I’m aware that writing is not at all equivalent to the relief the bird eventually gets but I hope it gives you a temporary escape. Writing with the emotion and complexity of yours has the power to move the hearts and inspire millions. This is a beautiful poem about your struggles, and I thank you very much for sharing it with me. I noticed that the poem runs through three different seasons: fall, winter and spring, symbolizing an end and then a rebirth where the bird (and by extension the author) is able to experience hope again. The poem also highlights the common struggles and thoughts that are shared everyday by the common person caught up in the horrible things around the world, and it’s a very touching insight into how a person feels both the depressing parts of reality and tries to hold onto hope – like holding onto a bird to prevent it from flying. Your poem does an excellent job at helping showing the conditions that Afghani women have to live in by comparing it to the life of a bird. When you state “Our nest is no longer a home” it really gave insight about the world that this is in. In this line alone, it portrayed this message of how these places are not even considered home because of all this damage that has occurred. While these are grim natures, I love how you are able to still be optimistic about the future and do that by showing the other side of the bird. This poem is a great representation and I hope you continue making these poems.